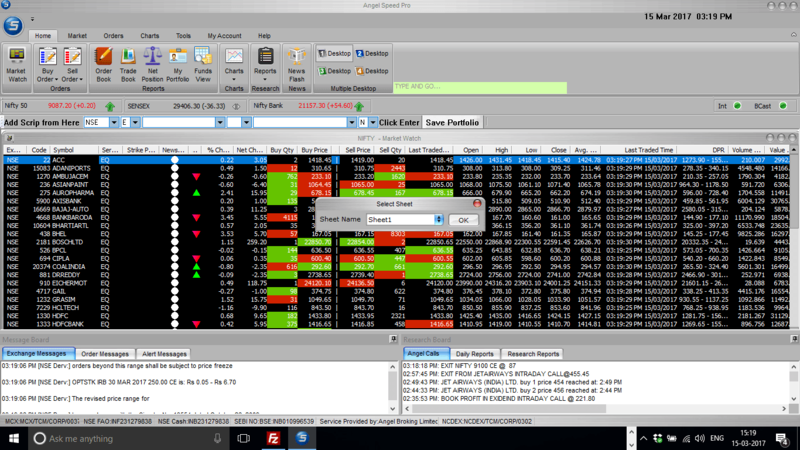 Angel Broking SpeedPro is a desktop based trading terminal which is recognized as one of the best trading platform in India. 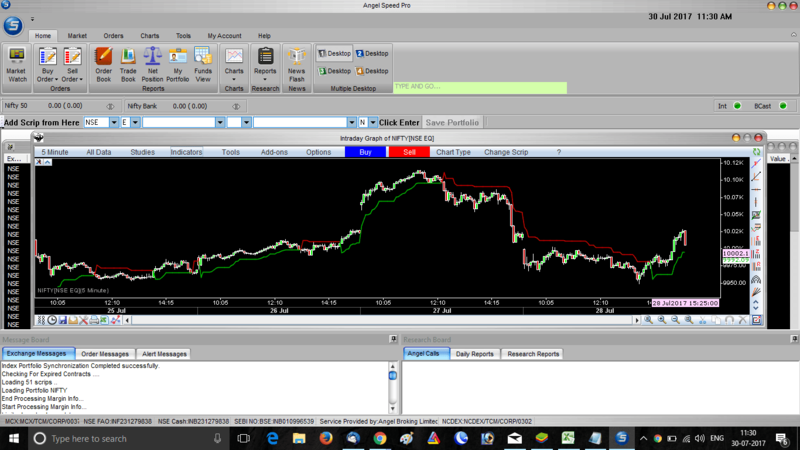 Lets have a detailed review of Angel Speedpro & understand its features. To use this Speedpro, one needs to install the application on desktop or laptop. Upon installation, an icon with an “S” would appear – this is a SpeedPro Starter program. To access SpeedPro, the user will have to access the SpeedPro Starter program which will ask for the client code. Then it will check whether the application SpeedPro is installed, if it is, then the application is launched. The first screen is the login screen wherein one needs to provide client code and password. On logging in, the homescreen shows the current market activities and trends- this is the viewing space. Above this viewing space, is a typical menu bar which would have access to all the features of this application. To access the market watch, one needs to visit the Home Button under the menu bar. Under home button, the first icon would be of Market Watch – user needs to click on that. Thereafter, the user can do a right click on the viewing space and choose the market that he/she wants to check – i.e. Sensex or MCX or any other market. One can keep adding scrip from across all segments to the market watch. To add a scrip, one needs to tap on Home Button and the market watch and then look for that scrip in the search bar given right under the menu bar and above the viewing space. Once the scrip details are mentioned, just press enter and the scrip would be added to the market watch. As said earlier, it allows adding scrip of various segments i.e. currency, commodity, F&O etc. at the same time. To place an order of a scrip appearing in the market watch, one can simply select that scrip and then click on Buy Order button under the Home Tab. Thereafter a small order box would appear on the down left side wherein the user can fill in the quantity and the price and execute the order. On placing the order, the research bar would get updated with the order message. Similarly, an order of selling a scrip can also be placed by selecting Sell Order button under Home Tab. The orders can also be placed by using certain keyboard shortcuts. The Home Button also provides access to various reports like day report, order report, net position report, portfolio report and fund report. Apart from reports, the Home button also allows access to charts and newsflash. Moving on to the research bar – The research bar basically consists of detailed reports and summaries published by Angel Broking’s research teams to educate the investors and help them in making informed trading decisions. It provides certain daily reports which are further divided into technical reports, derivative report, market strategy, market outlook and weekly reports. The report typicall capture the related subject matter as on that day. Apart from these, there are certain research reports which are based on either a specific company’s performance or an industry’s performance. Another special feature of this trading platform is Combined Best Five. This feature lets the user to have a simultaneous look at the top five best bids for buy and sell in both the markets i.e. NSE and BSE. This feature can be accessed Market Tab which is right beside the Home Tab. The user can select the scrips by selecting the Combined Five button. The next special feature is “Open in Excel”. This feature is said to be a very user friendly feature. Using this feature, the user can view the market watch in an excel sheet. The market watch with the specified portfolio is imported to excel and is refreshed on live basis. This helps the users to use excel tools to undertake their preferred analysis. This option is also available under the Market Tab which is right beside the Home Tab in the menu bar. The SpeedPro application allows customization of the interface to quite an extent so as to help make it user friendly. For instance, it allows the user to remove the menu bar and the research space so that the market watch or the viewing space can be increased. The users can also customize their preferences of order quantity, chart type, performance indicator, portfolio, workspace etc. For this, one needs to click on the “Tools” tab which is beside Home Tab. Another customization feature is that the application allows user to add the most used tools and options in the ribbon bar. For this, the user simply needs to click on the drop down symbol on the ribbon bar and then add the option. The application has many other features which can be easily explored while surfing through the application. The Trading terminal is definitely very useful & provide a lot of detailed reports, research & charts for all types of investors. 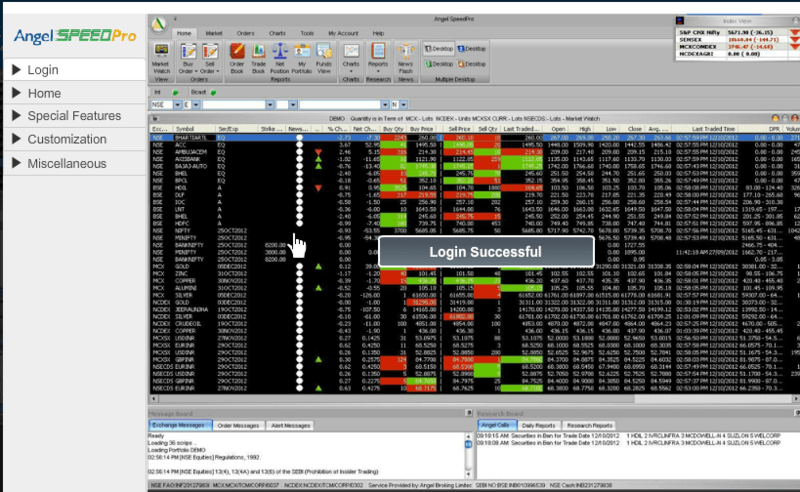 Speedpro is surely one of the best trading platform for customization features & market outlook feature aswell.